Hey, everybody, I don't know about your area, but as I'm heading out to go camping or other earlier morning activities, it's getting a little nippy. That means it's getting close to the close of the season. Kids will be back at school, and we'll have some normalcy and routine returned. Another thing that happens at the end of every summer is I try to do one big giveaway. 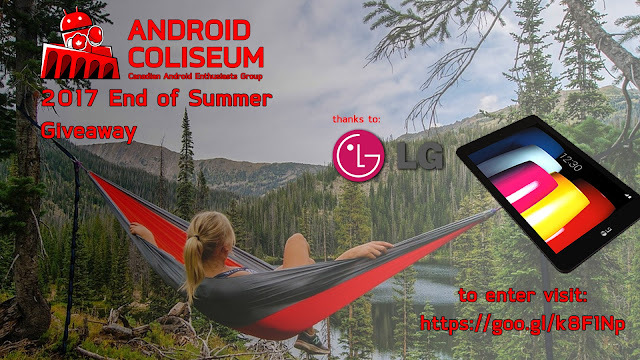 Thanks to LG, they've decided that the review I did on the G Pad IV 8.0 was great and want to give it to someone who's going to enjoy it - so it will be this year's prize. We'll be giving away the LG G Pad IV 8.0 with the Pad Plus Pack. Contest starts now (August 27) and will run until Sept 10th at noon (EDT).